Current clouds and storm patterns appear using satellite images so you can watch a three-day animation of cloud movement just like on the six o'clock news. Clear enough to see the "eye" of a hurricane. 3D Weather Globe & Atlas provides current weather updated every 15 minutes. This includes high/low temperatures, humidity, wind direction and speed, atmospheric pressure, UV index, dew point and wind-chill factor for more than 40,000 locations worldwide. Detailed seven-day forecasts let you plan the week ahead! 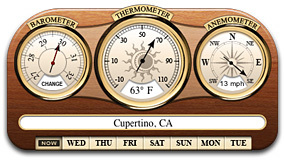 This stylish retro-widget sporting a barometer, thermometer, and anemometer is included with application for Tiger's Dashboard. The weather data for 3D Weather Globe & Atlas is provided by CustomWeather under a five-year agreement between CustomWeather and Software MacKiev. CustomWeather is a San Francisco-based company who supply worldwide weather feeds to Reuters and other news organizations. The real-time weather, weather forecast and cloud cover require a subscription to Software MacKiev's online weather data service. 3D Weather Globe & Atlas includes one year’s free subscription. After the free period is over, you can re-subscribe for $9.95 per year. If you don't want to re-subscribe, the application will continue to function normally, though the online features will no longer be available.